Nothing brings the people you love together like gathering around a dining table for a fantastic meal. 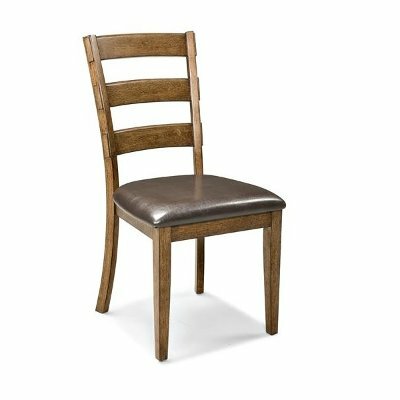 Now at RC Willey, this beautiful dining set provides great versatility with the inclusion of a bench. It's perfect for fitting three kids across giving you one more place at the table. It's also great because you can tuck a bench in underneath you table a little farther so when the table is not in use, you have a little more walking space around it. The lovely mango wood is complemented perfectly with the brandy finish making this table a must have for your home. It will look amazing in your home! Set includes table, four side chairs and dining bench. 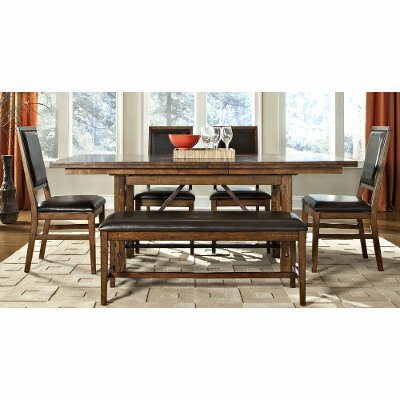 Create a dining space that is both modern and timeless with this beautiful dining table from RC Willey. Crafted from solid Mango and select hardwoods, the table features a 14" self storing leaf and is perfect for everyday use and for family dinners. Includes (1) 14" self-storing leaf, expanding table to 80"